Northern Ireland’s disused railway network is a forgotten piece of industrial and rural heritage being lost to time. Around 1,000km of former transport routes lie abandoned, winding through spectacular countryside, linking villages, towns and cities, major attractions and workplaces. It represents a major potential tourist draw begging to be developed. With a growing obesity problem, a greenway network could be a crucial part in the fight for better long term health outcomes. There is an opportunity to uncover our hidden past, build for a healthier future, and provide a world-class walking and cycling infrastructure for the local population and to market to the world. We can build a network of traffic-free pathways on the footprint of our abandoned railway network and former canals, and work to link them beyond. This is just the current map, and new greenway ideas continue to be added – the public have driven awareness of many new routes and will continue to do so. 1,000km of traffic-free paths, trailing to every corner of the country – what a spectacular selling point to promote tourism in Northern Ireland. There are millions of people across Europe and beyond who would consider basing a holiday to Ireland around long distance cycling trips. Even on a small scale, the 42km Great Western Greenway in County Mayo points to the potential – delivering tens of thousands of additional tourist trips into the area, along with an estimated €7 million boost to the economy, each year. Scale that up across the whole of Northern Ireland, with a vast array of journey options, could be amazing. Imagine the jobs we could support in the outdoor activity and hospitality sectors alone. Almost every major local tourist attraction would linked by this network. Old connections would be renewed between villages, towns and cities, with an alternative to private car travel. Safe space for individuals and families to walk or cycle, jog or walk the dog, opening access to our countryside. Northern Ireland’s abandoned railway network is no longer fully intact. With the mostly rural setting, some sections have been lost to agricultural lands, building development, industrial estates, and former railway buildings being renovated into domestic dwellings. These issues will need to be tackled if a continuous network is to be realised. Discussions between landowners, local communities and political stakeholders are vital to find solutions, whether by route diversions or access agreements. Linking traffic-free pathways and cycleways across developed towns and cities is a challenge, but should be pursued with vigour to add safety, promote sustainable travel, and aide urban renewal. I’m Jonathan Hobbs, and I started the Northern Ireland Greenways project in 2012. It’s all done in my spare time and on a voluntary basis. 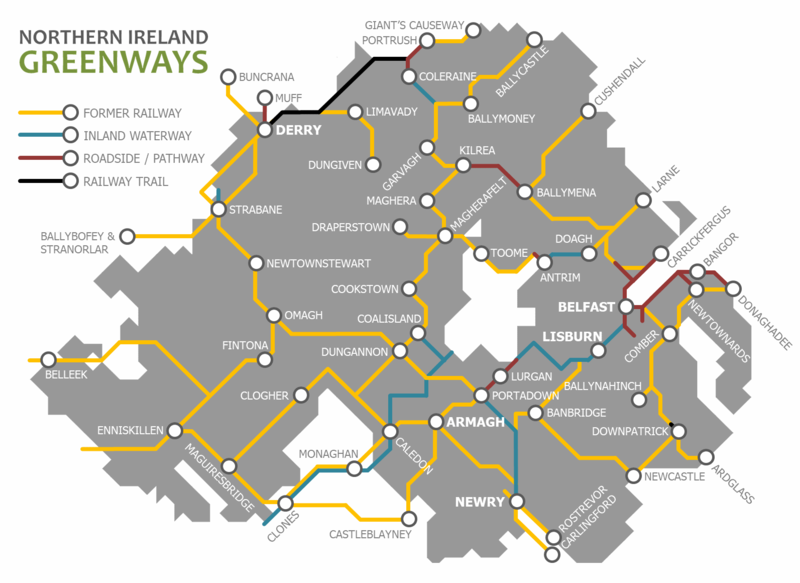 Four main things – a childhood passion for railways, a lifelong knack of slow cycling, a fondness for Google Maps, and watching the creation of the Comber Greenway in my city – all came together to spark a single idea: why aren’t we using our former railways to make a network of greenways? I’ve campaigned ever since to raise awareness of the idea, to document the potential routes, and secure political and community support for the overall vision. The Northern Ireland Greenways project reached a proud milestone in 2016 with the launch of the government’s 25 years, £150m, 1,000km greenway strategy. As a one-person volunteer project, Northern Ireland Greenways focuses on the high-level vision. Each individual greenway project needs its own strong local voice to raise awareness, secure political and community buy-in and drive towards delivery. It needs independent campaigners and champions. Lots of them. That could be you. Browse our list of greenway projects to find out what’s near you, and give us a shout if you want help or more information.